Local currency is very much needed during international travel. There're multiple ways to get our forex- the old fashioned way of going to a forex agent and converting INR to required currency, going to a bank to get Forex Card, withdrawing from local ATMs or the newer ways of ordering forex online. Which one is good? What are the pros and cons? This post attempts to list them and analyze a bit. Below are the 8 different options I could think of to get local currency. Unused cash- what to do? I used to go for the old fashioned #4 earlier. At recent times I prefer ATM withdrawal. There is no such thing as ‘cheapest’ option- each has its pros and cons. Currency rates fluctuate daily, different operators apply different conversion rates-many who claim not to charge any fee factor their charges in the conversion rate itself and give you a few dollars less. Plus if you’re going physically to a forex shop you’ve to consider time and effort involved. Some of them do door delivery if you request. So there’s a cost to convenience factor. Recently I withdrew 25000 Nepali rupee in an ATM in Kathmandu- ATM prompted that there’ll be a fee of 500 Nepali rupee. But in reality this withdrawal cost me 16750 INR after ICICI bank used its own conversion fee, added 125 INR fee and 25 Rs GST. Typical conversion rate used in Nepal is to divide by 1.6. That is 25000 Nepali rupee should have cost me 15625 Rupees + 312 Rs Nepal bank’s fee + 150 INR ICICI fee+GST. But I paid an effective INR 1125 more, because banks use unfavorable conversion rates and try to make some more money in the process. Effectively I got only 1.5 Nepali rupee instead of 1.6 per 1 INR. I feel ATM withdrawal is still good option particularly if your local forex vendor doesn’t have stock of currency you need. Getting USD and then converting local again will mean paying twice for conversion. A 77 USD WestJet ticket was supposed to cost me INR 5390 as per prevailing conversion rate at the time of transaction, but actual charge by ICICI was INR 5568, or roughly 180 INR or 3% more. At times it may be cheaper to get forex and pay in cash. Forex Card are good option- can be reloaded as needed, unused amount can be recovered, once loaded deducted at actuals. But Forex card works best in select regions- Europe, UK, Singapore, US etc. Many Asian countries where cash is the preferred mode, Forex Card may not be viable. Forex Card are also a good option- but you’d still need some cash as not everywhere card is accepted or welcome. Card can be used in most places in Europe but in Asia vendors prefer cash- this is because paying by card implies banks take a cut for each transaction, on top of what you’ve already paid for the card-so some vendors charge 1 or 2% extra for card payment, if they don’t have enough margin to factor bank’s charge. Airport conversions to be avoided at all cost as they are most expensive option. To be used only in case of emergency for a small amount. Ordering online is convenient, check how much extra you’ll be paying compared to your neighborhood forex agent. If the difference is not too much and you feel the time and effort you’ve to spend to go out to a forex shop is more valuable than extra premium charged by online firm, go for it- you can also try negotiate. If you’re frequent traveler and if rupee value is at decent level, it might be good idea to stock a few hundred dollars. Accepted worldwide and can be converted for local currency at destination on need basis. Given that you’ll be paying twice- once to get USD, once to get local currency, this option is not economical if you’re spending large quantity of local currency. ATM withdrawal is a good option- charges are fixed and per withdrawal- limited to your withdrawal limit- can be tried if you can manage entire trip with amount possible in withdrawal and you’re fine with some leftover/unused local currency. Not worth if you’re withdrawing small amount or withdrawing too many times. Where possible network with friends who may have unused local currency or can give you local currency in exchange for you paying them in INR. International credit cards can be used for online purchases. Factor 3-4% extra expense as bank will add some fee/use an unfavorable conversion rate. Prepaid Forex Card are good option- particularly for corporate travel or if your travel is long term or estimated expense is hard to predict (top up on need basis, recover unused amount)- but not possible to rely 100% on these- many vendors prefer cash. 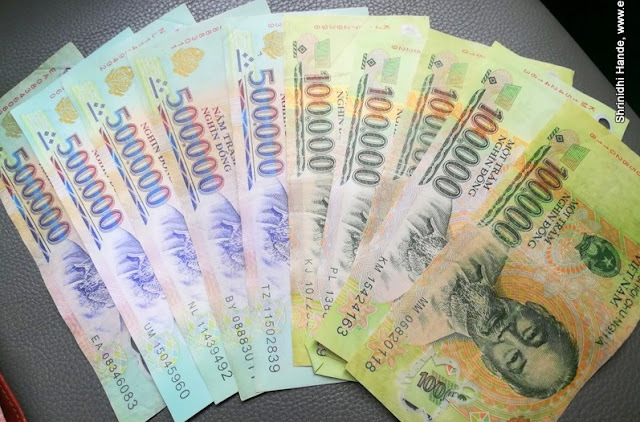 One big dilemma with hard cash is what to do with leftover foreign currency notes? If it is small amount you can keep them as souvenirs. If you have plans of visiting same country again, you can of course re-use them. It might be worth storing some currencies- currencies like USD/Euro are almost guaranteed to appreciate over time. USD is 68 INR today, may probably get cheaper to 65 INR per USD but if you hold for a few years, it will almost certainly be worth 75-80 INR. (unless something drastically changes). Whereas less popular currencies no one wants to buy and will be useless unless you visit that country again. One way to salvage this is to convert them during transit- like you may not visit Philippines again- but if you have some Philippines currency you can possibly convert them while transiting through hub airports like Singapore or Kuala Lumpur- you will get poor rate but better than losing it all. One more risk is demonetization. Maldives had stopped old 5 rupaiya notes- I had 4-5 of them and they are worthless now. If it happens with bigger currency notes and you have many of them, you carry a risk of losing it 100% in value. I do hold bit of currency notes from various countries I have visited- not sure which one of them are already demonetized or have lost their value completely. Do share your thoughts... What is your preferred mode of getting forex? Very detailed and useful information. Based on my experience during recent trip to Europe, I would vouch for a multi currency forex card. This gives you a hassle free freedom to spend as you like. The first loading is done before you depart at a predetermined rate of conversion. I used the services of bookmy forex.com, who have tie up with Axis bank which I feel is one of the best. You can complete the process of buying the forex card online & the card will be delivered to your address within 24 hrs.The card can be used like any debit card at most outlets who accept Visa/Master card. During your travel abroad, if you need more money, you can reload the same card.The best part is you get a statement of your spending, countrywise, currency wise. You can try it out for once. Yes, I have used forex card during Europe trip- works well there. But in other parts of the world like say Thailand or Bali, most vendors and shops prefer cash. What's new at Airlineblog in March 2019?